These trends will never go out of style. While there are many trends that come and go, there are those that remain tried and true. They are the trends that come with the ability to withstand the test of time and are some of the most coveted when it comes to the kitchen, the heart of the home. As one of the highly trafficked areas of the home, the kitchen is a space that particularly thrives on good, well-thought-out design, which can not only withstand heavy use, but can remain stylish for years to come. “The hearth of the home is the place where you and friends and family will gather and you want to make sure that it reflects your personality and feels ‘warm and welcoming,’” says New York-based designer, Robin Wilson. Since renovating a kitchen can be one of the most costly rooms in the house to undergo a transformation, people want to know that they are putting their money into materials, finishes, and styles that are going to last. Better yet, styles that aren’t going to feel dated in a few years, and are likely going to have a higher curb appeal when it comes to re-selling (should that be your goal) in the future. So, in many cases, these options will give you the best return on investment. From sleek, durable materials to classic finishes, these stylish kitchen design ideas are more than just trendy. Check out our favorite kitchens we’ve seen this year for all the inspo. Open shelving has become increasingly popular in the past few years, as we saw more and more kitchen renovations opting for the cabinet-free look. While not for everyone (this definitely forces you to keep organized, as everything is on display), open-shelving has the serious upside of providing a brighter, bigger storage option. We’re not necessarily suggesting you rip out all of your cabinets and go for exposed shelves everywhere, but in more tight spaces where dark upper cabinets can make it feel even more cluttered, this budget-friendly solution is an absolute winner. In many cases, open-shelving above the sink or above the stove can give the illusion of added space, but there are many ways you can still make this trend work. In any case, it’s a great way to show off stylish dinnerware. 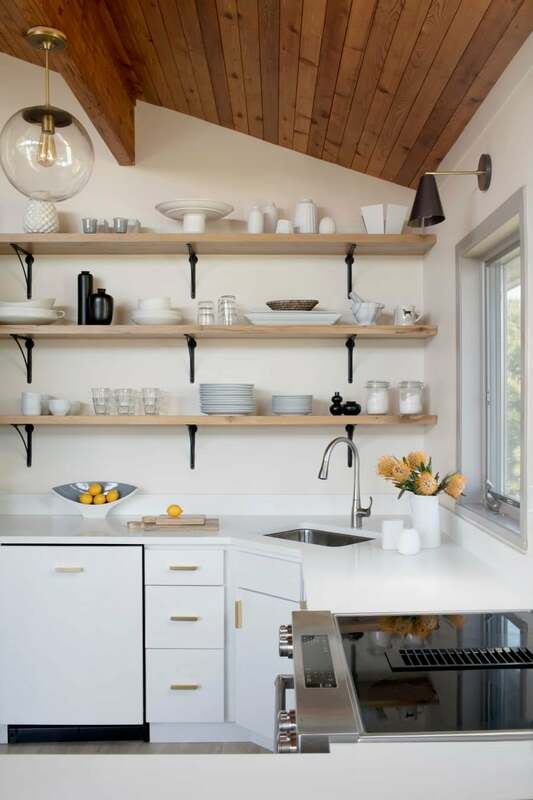 Here, HGTV designer Leanne Ford even chose to go with exposed shelving in the kitchen island, while this breezy California home added some warmth and texture to their all-white kitchen with some natural wood shelves. Really, the possibilities with this one are endless. We hate to be the ones to tell you, but granite countertops have been on the decline for some time now. According to a study done by Houzz, granite has been on a three-year decline among homeowners as people are opting for more classic or creative choices. Perhaps one of the most popular alternatives has been marble, which is easy to decorate with and timeless. Carrara marble provides a grayer tone with softer veins and is typically a bit more inexpensive, while Calcutta marble, which tends to be a bit whiter with more dramatic veining is a more luxe version. Overall, it’s a beautiful natural material with tons a variety available. From thick slabs used on a main kitchen island to thinner pieces used on regular counters, you can tailor marble to your home and needs all the while making a classic, elegant statement that feels as luxe as it looks. Just make sure to read up on proper marble counter care before you go ahead and make the switch. But even if a complete kitchen reno isn’t in your future, you can still get that sought-after marble look with a little creativity and contact paper resembling marble. This might seem obvious, but you really can’t go wrong with an oversized, multi-functional island in the kitchen. It’s the perfect place to prep meals, gather, or sit and eat breakfast, and becomes somewhat of a communal meeting place in the heart of your home. Not to mention that as open floor plans remain the most popular, having the extra surface and storage space is both a useful and functional aspect we can get behind. And since your kitchen island is separate from the rest of your counters, you can be creative about the color, finishes, and countertop you choose. Modernize and add customized detail to your kitchen by going for the timeless two-toned look, where there is a subtle contrast between the backsplash and cabinets instead of an exclusively monochrome space, or add contrast by painting your island a bold or complementary color. No matter what you chose, it’s safe to say everyone wants a large, beautiful kitchen island. Statement lighting is having a major trend moment, and it doesn’t look like its about to go anywhere soon. Adding personality, a focal point, and of course, light to your kitchen space, you virtually can’t go wrong by adding a pair of pendant lights over your island. These statement-making fixtures have been popping up in many of team Domino’s favorite kitchens and we’re loving the dramatic impact they can have on a space. From antique finds to modern hanging globes, pendant lighting is as versatile as it is useful. The best part is that they are an accessory you can easily change out down the line. Choose from tons of chic overhead light trends, or go for something more classic, depending on your style and kitchen’s aesthetic. Farmhouse sinks, trough sinks, single basin sinks, they all have one thing in common: they are big. Gone are the days of your average-sized sink, that would easily pile up with just a few dishes. The trend that’s here to stay is the bigger the better. Championing size in this functional area of your kitchen has proven to be key, giving new meaning to the phrase “all that and the kitchen sink.” And it makes sense, considering how much use it gets. Thanks to the likes of Joanna Gaines and her love for a good farmhouse kitchen with a farmhouse sink, the sink has become yet another focal point in the kitchen. From porcelain to stainless to copper, matte black, and so many more, there are tons of stylistic options you can go for here, so long as it’s a little bit oversized, your future self will thank you. The sink in this Massachusetts colonial is central to the back counter space, while the large vintage sink in this tranquil New York apartment feels fresh and stylish. Goodbye freestanding appliances, hello built-ins. Today, no modern kitchen is complete without quality built-ins, you know, the kind that visually integrates your useful (and necessary!) appliances into the rest of your kitchen layout. Refrigerators, dishwashers, microwaves, and stovetops have become a seamless part of your space, giving it the most modern, clean look. You can opt for built-ins that fit into a cavity of your cabinetry but still maintain their obvious appliance facade, or you can go all out with fully integrated appliances. For a fully seamless look, the front of integrated appliances matches the look of your cabinetry and can help you to achieve a furniture-style look in your kitchen. This can be especially important when you have an open floor plan and you can see your kitchen from other rooms of your home. Proving to be a popular choice among newer kitchens, this smart trend is definitely going to stick around. If fully integrated appliances aren’t your thing (or aren’t in your budget) stainless steel is more than just a trend, but a staple for your appliance finishes. The metallic look is one that has become synonymous with an up-to-date kitchen and one that buyers and homeowners alike have come to expect. How many times have we watched an HGTV couple turn down a home because it didn’t have updated (read: stainless) appliances? The major pro is that they don’t show wear and tear easily, meaning they’re likely to last and look new for longer. Somewhat of a newer trend, the concept of turning what may have previous been an eye sore in your space into a cool focal point is something that will make an unexpected statement, and add a customized detail to your kitchen. Turning your standard range hood into an intentional part of your kitchen can some in a variety of different forms. Mostly, these come in the form of a custom job that builds over the standard hood to seamlessly camouflage it with the rest of your cabinets or kitchen, or high-end additions to luxe ranges.